Don’t hesitate , Ask us ! How does Natura Quartz surfaces compare to granite ? Quartz slabs are 93% quartz, a natural stone. Quartz is the extremely hard mineral that gives its strength. Granite is only about 40% to 60% quartz, along with other softer minerals and impurities. 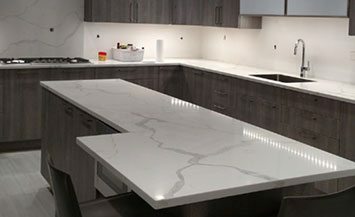 With Quartz countertops, you get the look and feel of granite, but receive greater strength and the benefit of it being nonporous and maintenance free. Just wash it with warm water, and use a mild soap if desired. Quartz is stain resistant and never needs sealing or reconditioning. Granite is a porous stone and needs to be sealed regularly with a chemical treatment. It can absorb liquids and food, risking potential staining and bacterial growth within the countertop. How durable is quartz ? Natura Quartz slabs are the most durable surface material engineered stone. Quartz ranks number 7.0 on MOH’s Hardness scale, which is used to measure the scratch- resistance of a material. It is resistant to cracks, chips, scratches and stains. Although it is very durable, excessive amounts of stress from objects can harm the surface. Can I cut on my quartz surface ? Engineered stone is more ‘stone like’, because it’s a mixture of 93% quartz and 7% polyester resin which is pressed into slabs. Due to this mixture it has superior strength and beauty. Although your knives will not ruin Quartz countertops, using a cutting board is suggested to avoid dulling the surface. Do I need to apply a sealer to Natura Quartz surfaces ? Due to quartz non-porous surfaces, you will never have to apply sealer to any of our surfaces. Are Natura Quartz surfaces really indestructible? No. Quartz, like any countertop surface, can be damaged with extreme abuse. If in fact you are able to chip the edge, we will be able to repair the damage in most cases. Since quartz is not porous, it is easy to keep bacteria-free for a healthy home and some manufacturers also add silver ions to aid in repelling bacteria. How are Natura Quartz surfaces produced? Quartz is a manufactured surface that is made by mixing 92-5% ground natural quartz with 5-8% polymer resins. The result is a material that still looks natural, but the engineering provides for more consumer customization based on the individual’s design plans. In which areas of the home should quartz be used? You can use quartz for kitchen counters, bathroom vanity tops, fireplaces, shower surrounds, windowsills and coffee tables. Businesses can use quartz for food service counters, conference tables and reception tops. Just remember that quartz cannot be used for exterior purposes as it can discolor with too much exposure to ultraviolet light. What special precautions should be taken when cooking near quartz? Quartz can be affected by extreme heat, so manufacturers recommend using cutting boards, trivets and hot pads while preparing meals. Quartz is very durable, but remember that any material can be damaged if not cared for properly. Are Natura Quartz slabs color consistent? Natura Quartz slabs are made from pure, natural quartz. Variation in quartz, color, shape, shade, pattern and size are unique traits of quartz slabs . Although some quartz colors may be more consistent than granite, color variance is an inherent trait expected of quartz slabs. In addition, small blotches or random distribution of particulates are an inherent part of overall design and composition and are not considered to be defects or product non-conformity.